As I write this, Venom Snake is waiting in a Porta Potty north of Kabul during a sandstorm. I feel a little bad about it, to be honest. I’d rather leave him at Mother Base or with Pequod in his helicopter. In a pinch, though, when Snake is in the field conducting an operation and I am obliged to turn off my PlayStation in order to do something less interesting than playing Metal Gear Solid V: The Phantom Pain—like writing this Kotaku article, or eating dinner with my wife, or playing with my children—I try to leave Snake in a Porta Potty. I never want to abandon him when he’s prone on the ground, surrounded by Soviet soldiers who have been alerted to his presence. How philistinish! How gauche! For the first time in my long history of playing video games, though, I could do that. Thanks to the suspend-and-resume feature on the PlayStation 4, I can use Rest Mode to stop and restart Metal Gear Solid V on a whim, a majestic power that my younger self fantasized about while, say, racing through World 8-2 in Super Mario Bros. while my mother was demanding that we leave the house to go somewhere. The Xbox One has a similar feature—had it first, in fact!—but I have not tested how well it works with Metal Gear Solid V. I assume it works fine. I remember being astonished by The Legend of Zelda’s ability to save my progress between play sessions when the Nintendo Entertainment System was turned off. 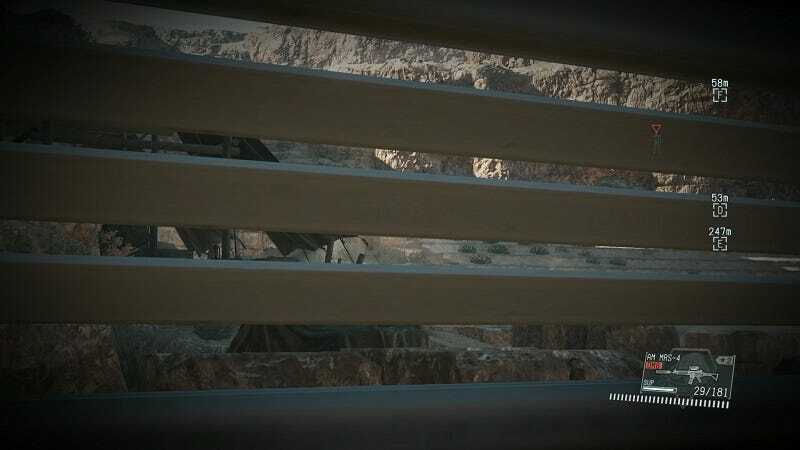 Suspending a Metal Gear Solid V session—a perma-pause that allows me to enter and exit a game willy-nilly without relying on where the designers put checkpoints—gives me the same feeling of awe. Finally, I can drop in and drop out of a video game just as I would a book, a DVD, or a television show on my DVR. On PlayStation, suspending a Metal Gear Solid V game works nearly flawlessly. You will be bumped, naturally, from the game’s online servers, but you can reconnect with a tap of the touchpad and a click of a button. I like to go into Rest Mode after tapping the controller’s touchpad for the game’s true pause screen, to remind me to reconnect to Konami’s servers when I start playing again. It takes mere seconds and you’re back up and running—or down and crawling—again. Compare this to Destiny, which tosses you from wherever you are in its world, even a single-player Taken King mission, if you dare to suspend it. You’ll start again from your spaceship in orbit the next time you turn on your console. That’s understandable if I’m on a three-person Strike somewhere, but I’m not sure why my Hunter can’t take a break when she’s all alone on a story mission. It’s also a lot better than how Madden NFL 16 treated me on Xbox One. Every time I disconnected myself from EA’s servers by turning off my machine, the game would freeze when I turned it back on. I would be forced to manually quit the application and restart it in order to begin playing again. This would happen even if I turned off my Xbox while I was in a Madden NFL menu screen, between individual football games. So the ability to stop and restart, to perma-pause at will, in a game like Metal Gear Solid V is a godsend, especially for adults with jobs and families. Did the baby wake from a nap? Do you need to pick up your kids from school? Did work just call about an emergency project? When suspend-and-resume works properly, never again do you need to arduously replay a bunch of stuff just because life intervened. With great power, as we all know, comes great responsibility. Certainly, if your children are crying, you should put Metal Gear Solid V into rest mode, even Snake is coated in blood and a bullet from his sniper rifle is hurtling in midair toward a Soviet soldier’s forehead. It feels wrong to me, though, to pause the game in the middle of an action sequence if I have time to bring Snake to a more restful place. This feeling isn’t unique to video games. All works of fiction—books, movies, TV shows—have natural stopping points, like act breaks and episodes and chapters, or even smaller elements like scenes and paragraphs and even sentences. Putting Metal Gear Solid V into rest mode while Snake is in the field is like turning off Star Wars right when Luke Skywalker lowers his X wing into the Death Star trench. It’s like closing a book in mid-sentence. When you start watching or reading again, you’ll have robbed the experience of some of its power. Waiting for a better moment to turn off the game is not only a gesture of respect for the work, but it’s also a way to extract more pleasure from it. That’s what the Porta Potties in Afghanistan are for me: a way to feel like Snake is biding his time patiently in a fictionally appropriate place, smoking his cigar as the hours pass, waiting for just the right moment to crawl through some more grass. I know that in the game’s actual fiction, when I start my PlayStation again, Snake won’t realize that even a second has elapsed. But I’m happier knowing that my perma-pause has a fictional justification, so it feels like Snake and I are waiting together. Perma-pausing, done right, binds me closer to Snake. It puts us both in the same mindset, away from the action but eager to return. That’s why I like to get Snake to his helicopter, or Mother Base, or kneeling next to D-Horse on the verge of scoping out a new side op with his binoculars before I power down. I’m not engaged in the fight when I’m not in front of my console, and so Snake shouldn’t be, either. I’m not using the real capability of rest mode when I get Snake into a position like that. Each of those moments is a checkpoint in Metal Gear Solid V’s auto-save system. I like the feeling, though, that I’m re-opening the very same game that I was playing, a precise stopping point that I chose on my terms and for my own reasons. Snake will be frozen in amber until I get back, not magically regenerated at an almost-the-same moment, a few feet and a few seconds away. It’s the subtle but vital difference between being able to start on the first full paragraph of a new page when you return to an engrossing novel, and being forced to read every word on the page again.